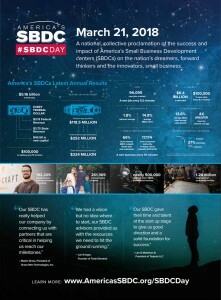 #SBDCDay is a national, collective proclamation of the success and impact America’s Small Business Development Centers (SBDCs) have across the nation in economic development and the small businesses community. America’s SBDC Day will take place on Wednesday, March 21, 2018. #SBDCDay will unite the nearly 1,000 SBDC centers across the country and the hundreds of thousands of clients they serve by sharing, in real time, the success stories and notable impacts SBDCs collectively have on the small business community at large. This special day will be celebrated with social media campaigns, public relations initiatives, online and in-person events and more.